New Dundee United manager Robbie Neilson says he has improved as a manager as a result of his time at MK Dons. The Scot took charge of Dons in December 2016 following the sacking of Karl Robinson while the club were in League 1. Neilson guided Dons to a top-half finish in his first season, but struggled in his second. 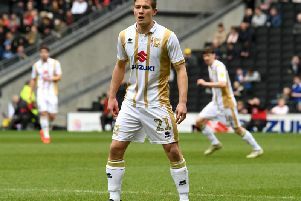 When Dons slipped into the relegation zone in January, his time was up and was replaced by Dan Micciche, who in turn lasted three months before he too was sacked. Neilson, who previously managed Hearts before moving to England, took over at Tannadice on Tuesday, and believes his time at Stadium MK has helped him improve as a manager and he looks back on his time fondly. "I had a great time down there," said Neilson, who took MK to 12th in League 1 in his first season. "The first eight or nine months were brilliant. It's a great club with great people. "The issue in England is if you have two or three months that are difficult then that's the end. You accept that. "It was a fantastic experience and I feel coming back I'm in a far better place than I was when I went down."